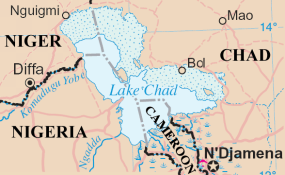 A map showing Lake Chad and surrounding countries. Lake Chad is the world's shallowest lake; a great inland body of fresh water shared by Cameroon, Chad, Niger and Nigeria. It's critically important, both economically and culturally, for millions of people in one of the world's most impoverished regions. Its levels have varied dramatically for decades. The Sahel region in which the lake lies was hit by droughts in the early 1970s and again in the early 1980s. This severely dried out the lake by the mid 1980s. Since then, levels have recovered to some extent, but heads of state, their cabinets, and Western aid organisations have presumed that Lake Chad was on a downward path - a victim of global climate change. These concerns led the four countries' governments to commission several studies between 2008 and 2010. From this, an extensive report was published in 2014. It was led by French water scientist Jacques Lemoalle and geographer Géraud Magrin. One study, as yet unpublished, gathered data to determine whether irrigation may have adversely affected the lake. Another, contained in the 2014 report, examined how much water would be needed to restore it to its former large state. This second study had a geopolitical angle: if the lake's ills could be pinned on the forces of global change, international climate change negotiations would hold the promise of dozens of billions of dollars needed to build and maintain an inter-basin water transfer system, to bring waters from the Congo Basin into Lake Chad's main tributary. This would be an economic boon for the region. But there was a problem. No study has ever looked at the link between global climate change and Lake Chad's complex hydrology, nor at whether irrigation has any effect on lake levels. And, the evidence suggests that Lake Chad is not actually drying out. But it has seen dramatic variations - up and down, sometimes from one year to the next - since 1970. My own ongoing research on Lake Chad focuses on northeast Nigeria, home to around 25 million people: they are most vulnerable to the lake's risk of severe droughts. Working with the hydrological data collected by Lemoalle and his team since the 1950s, I am trying figure out this risk, and to determine if it is linked to global climate change and local irrigation. My work involves statistics and data. By applying these within a particular framework, I can test whether these links are real. The framework I use is Bayesian statistics. It comes from an idea developed by English vicar Thomas Bayes in the 1700s. This approach calculates probabilities of unobserved events based on their relations to observations and on one's beliefs about them. It took off about 20 years ago when computers became powerful enough to handle the massive computations involved. It is a form of supervised machine learning: The computer explores myriads of possibilities and evaluates them according to the underlying probability models. It then concentrates around the most relevant ones in view of the observed data. For example, we have bi-weekly lake-depth measurements on the Chadian side since 1956, and daily flow measurements for the lake's two main tributaries. Lemoalle and his colleagues' hydrological model relates these to the lake's Nigerian side, which is not directly observed. But their model has major uncertainties. I use Bayesian statistics to calculate these uncertainties, give estimates of Nigerian lake levels, and relate them to rainfall data in the region. This work is performed with a team of undergraduate and Master's students from Michigan State University, Purdue University in Indiana, and the Ecole Polytechnique in France. Here are our key preliminary findings, so far. Global climate change is unlikely to be the reason for the lake's variations. Lake Chad's levels do not relate to global average temperatures in any model my team has tested. It's often said that you can get statistics to say anything you want. In this case, no matter how one tries to torture the data, it's not budging. It won't let us attribute Lake Chad's variations to global change indicators. Irrigated agriculture, which is used by the millions of small-scale farmers in the regions around Lake Chad, does not seem to have any negative effect on the lake. The only substantial correlation we are finding is positive: a good rainfall year in Northeast Nigeria benefits the lake's north side, and appears to benefit farmers living around 100 miles upstream. There is still a great deal of work to be done in understanding Lake Chad and its shifts. We plan to run predictive analytics to see if local population growth estimates may change our conclusions over the next decades, driving the lake's resources into unsustainability. We also plan to partner with Nigerian academics to gather economic data and test an "ecosystem services" hypothesis which Lemoalle offered to me: while no one benefits from the lake's north side drying out completely, a "small" Lake Chad is actually a good thing for fishermen, pastoralists and farmers. Incorrect beliefs about scientific facts propagate too easily. Breaking them is an uphill battle. My students and I will continue to use statistics and data science to dispel misinformation about Lake Chad.